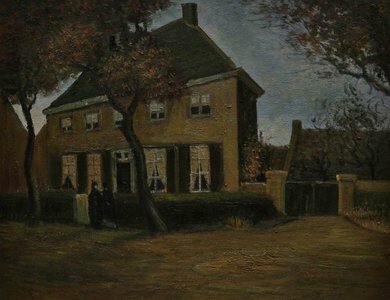 Painted in Nuenen, this painting depicts the house where Vincent Van Gogh lived with his family before he moved to Arles. 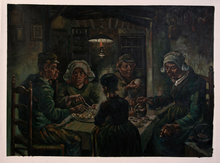 At Van Gogh Studio, you can find oil reproductions of several Van Gogh paintings including the Vicarage at Nuenen. 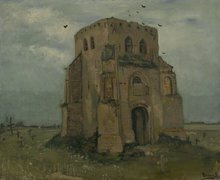 We work with superbly talented Dutch artists from Holland and the rest of the world who have studied and analysed Van Gogh’s paintings and techniques for many years. Our goal is to make sure that the replica you receive is just as great as the original. We ship worldwide, making it easy for you to get our wonderful paintings, no matter where you are. But in any case, if you are dissatisfied with the final painting, you can take advantage of our 100% money back guarantee and return the painting. 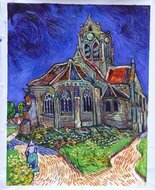 Since Vincent’s father was a pastor in Nuenen, a small town in Netherlands, Vincent came to live with his parents in 1882 after staying a few months in Drenthe. The laundry room of the house was converted into Vincent’s studio. 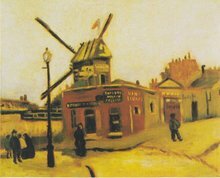 Since the laundry room was on the top floor, Vincent was able to get a great view, which clearly showcased in his painting. The painting depicts Vincent’s house in Nuenen, where he lived with his family. There are trees all around the building with big windows on the ground floor. The windows on the upper floor are smaller and Vincent’s father offered to make them bigger for his studio, but Vincent declined. There are quick bold movements and the colour palette used is on the darker side. The leaves on the trees are also reddish, making it seem like Vincent painted this during the fall season. You can go see the original painting at the Van Gogh Museum in Amsterdam. The painting did arrive. It looks great!!! !